These brightly-colored tumbled stones are dyed agate. Before dying they were a uniform white or milky gray color. The dye has made them more colorful and appealing to many people! What Are Dyed Tumbled Stones? Dyed tumbled stones have been treated with a dye to alter their color. The purpose of the color alteration is usually to increase their visual appeal and marketability. Sometimes they are dyed for a special event or project. The stones selected for dye treatment are usually nice in every way - they simply have a color that is plain, weak, or uninteresting. 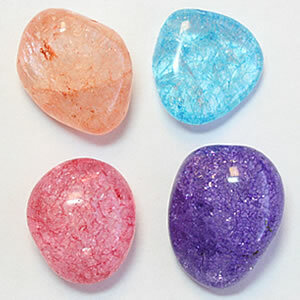 Lapidaries (people who work with gem materials and ornamental stones) have used a wide variety of methods to change the color of stones for thousands of years. In Book 37 of his Natural History, written nearly 2,000 years ago, Pliny explained how ancient lapidaries boiled gemstones in honey as part of the process of changing their color. Dye and many other methods such as heating and bleaching have been - and still are - used to change the color of many types of stones. Perhaps you would be surprised to know that most of the rubies and sapphires sold throughout the world today have been treated in some way to improve their color? And, most emeralds have been treated with additives that fill fractures and improve their clarity? Gemstone treatments are the norm rather than the exception. 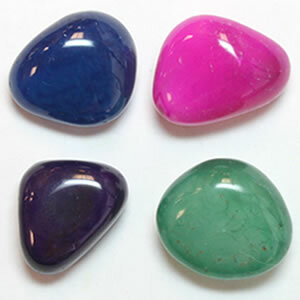 Outrageous Colors: Most tumbled stones that have been dyed are very easy to recognize. Many of them are dyed an outrageous color that is almost never seen in nature. People who are interested in rocks, gems and minerals will recognize these dyed stones immediately. Dye Accumulates in Fractures and Pits: The use of dye can also be detected by closely examining the surface of the stones. Dye accumulates in fractures, pits and areas of low relief. The dye color is much darker in these areas, while at the same time it is much lighter on smooth and flat parts of the stone. Shallow Penetration: The dye is always applied after the stones have been tumbled and polished. This is because most dyes are only able to penetrate a short distance into the stone. 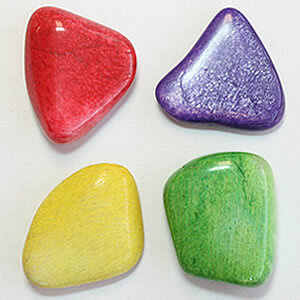 This gives dyed stones a brightly colored surface without deep penetration. If these stones are scratched, chipped or scraped, an undyed interior is usually revealed. You can also break a stone, scratch through its surface or touch it against a grinding wheel to see if the interior is undyed. Nail Polish Remover Test: Before you begin, know that this is a destructive test. Do it on stones that are not important. Most of the dyes used to color tumbled stones are soluble in nail polish remover. Get a cotton swab and dip it in nail polish remover then use it to scrub the surface of a stone that you believe has been dyed. Most dyes will be dissolved by the nail polish remover and produce a colored stain on the cotton swab. Although most dyed stones are easily recognized using the information above, experienced persons can be fooled when the color is closely matched to a natural material. The first specimens of dyed howlite produced were a beautiful turquoise blue color. Lots of smart people thought they were genuine turquoise. Lots of smart people are still fooled by dyed howlite! It is often sold without any effort to inform the consumer. When dyed gemstones are offered for sale, potential buyers should be informed that dye has been used to modify their colors. We used to sell a lot of a product named "Souvenir Mix" that contained about 40% dyed stones. Photos of dyed howlite, crackle quartz, dalmatian stone, feldspar and granite - the dyed stones most often found in our Souvenir Mix can be seen on this page and are included on our tumbled stone identification chart. We always informed buyers that about 40% of the stones in the mixture were dyed. We also told customers that the stones might not be colorfast in contact with water or extended periods of intense sunlight. This information was included on our website, in the shopping cart, on the receipt and on the package label. As I write this in 2017, I can say that I never saw another vendor place such a label on dyed tumbled stones. We stopped ordering dyed stones from our suppliers because we didn't like selling a product that would change color so easily. Howlite and magnesite are some of the most frequently dyed stones. They are popular for use in making tumbled stones, many types of beads and other items. Howlite and magnesite are white stones that readily accept dye with predictable color results. They are often dyed bright blue colors to resemble turquoise. What Types of Tumbled Stones are Dyed? The types of tumbled stones that are often dyed include: howlite, agate, dalmatian stone, feldspar, jasper, quartz, magnesite and granite. We have posted photos of dyed specimens for each of these types of stones in the right column of this page. The characteristics of these stones that make them favorable for dying are explained below. 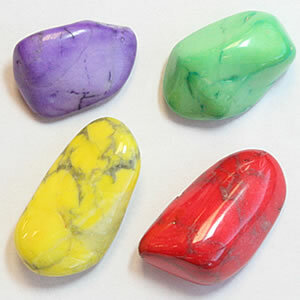 Howlite is an excellent material for making dyed tumbled stones. It is usually a bright white color that faithfully assumes the coloration of a dye. It is also a softer mineral (3 1/2 to about 4 1/2 on the Mohs Scale). Because howlite is so soft it shapes and smooths quickly in a tumbler, and it is still hard enough to accept a moderately bright polish. The quick shaping saves electricity in the tumbler, enables increased factory throughput, reduces labor and saves grit. All of these savings make dyed howlite much less expensive to produce than the cost of tumbling a harder alternative material and selling it without dye treatment. Dalmatian stone readily accepts dye to produce brightly colored stones with black spots. The material used to make the lapidary material known as dalmatian stone is a white igneous rock with contrasting black amphibole crystals. The white matrix is composed mainly of albite, a plagioclase feldspar. The plagioclase is white and readily accepts dye with faithful color reproduction. The plagioclase is also soft (6 on the Mohs Scale) compared to the typically tumbled agate, jasper and quartz (7 on the Mohs Scale). As a result, dalmatian stone is very economical to tumble and dyes with great results. 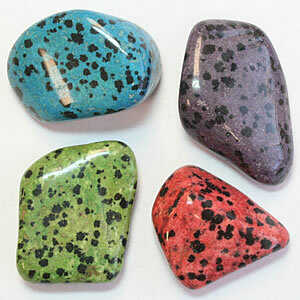 The resulting tumbled stones are brightly colored with large black spots. Here are some nice crackle quartz dyed a variety of different colors. Crackle quartz is produced by heating clear quartz, then quickly quenching it in a cool dye solution, and allowing it to soak. The quenching produces tiny cracks within the quartz which serve as conduits for the entry of dye. The cracks allow the dye to penetrate deep into the stone. The result is a transparent colored stone with bright internal reflections produced by the interaction of light with the tiny fractures. This is a great way for a tumbled stone manufacturer to use milky or somewhat included quartz to produce a pretty product. Many types of light-colored feldspar can be dyed with faithful color reproduction. The dye penetrates deep into the rock along tiny cleavage planes. With a Mohs hardness of 6, feldspar is softer than the quartz, agate and jasper that is typically processed in a commercial tumbler so they can be tumbled in less time and at a much lower cost. These materials also crush easily into blocky fragments that can quickly be tumbled into nicely shaped stones. White feldspars such as microcline and albite are easily penetrated by dye to produce stones of predictable color. That is why dyed feldspar is sometimes seen in tumbled stone mixtures. Granite is an unexpected stone to see in tumbled stone mixtures, however, when white granite is dyed it can be colorful and attractive. Igneous rocks composed primarily of feldspar can be quickly tumbled and easily dyed to produce beautiful tumbled stones. These stones are banded agate that has been dyed. Each band has a slightly different permeability and accepts different amounts of dye. That is what causes the color variations. Before dye treatment these stones were likely less interesting shades of white to light gray. Agate is one of the most widely dyed stones. The bands often have different levels of permeability and that leads to different dye intensities within a single stone. No time is saved in the tumbling process so dyed agate is not always well represented in tumbled stone mixtures. 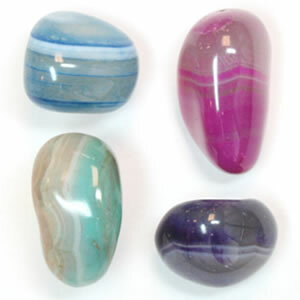 However, the attractive color-banded stone is very popular in beads, bookends, slabs, and many ornamental objects. Dying is done after the stones are tumbled rather than dying rough materials. This produces the best results as the dye usually does not penetrate deeply into the stones. After the stones are tumbled they are placed in vats of dye and allowed to soak for up to several weeks. That amount of time allows the dye to penetrate the stone and produce uniform surface color. The photos on this page show how colorful dyed stones can be. Although many of the colors are not typical of any natural-color material they are spectacular, attractive and appeal strongly to some people. These are the advantages of dyed stones for the consumer. The manufacturer benefits because dyed stones can be produced using rough that is abundant and otherwise would be of limited commercial value. Because most of the materials used for dyed stones are relatively soft and tumble quickly they can be processed into tumbled stones with less labor, lower cost and with a higher factory throughput. Dyed stones are also purchased by some people who would not have purchased stones with a natural color, thus increasing sales. These are the advantages of dyed stones for the manufacturer. Many of the dyes used to color tumbled stones are not colorfast. Some stones are treated with water-soluble dyes that can wash out if exposed to water. The buyers of these stones are sometimes surprised when the dye comes off on wet hands, transfers to clothing, stains the soil in potted plants, colors the water in fish tanks or causes other problems. Some dyed stones will also fade when exposed to direct sunlight. We once placed some tumbled stones in some outdoor plantings. The next spring we were surprised to find that much of the dye had either been removed by the rain or faded by the sun and they were white to gray stones with some spider-web color in surface irregularities. When we first started selling tumbled stones we found that dye-colored stones were widely available from suppliers. Our suppliers told us that they sell more tumbled stone mixtures that contain a significant number of dyed stones than mixtures that contain only stones without dye treatment. For that reason we began selling only tumbled stone mixtures with up to about 40% dyed stones. A few years later we discovered that undyed stones sold just as well to the visitors of our website. When we discovered that we put the dyed stones on sale and never ordered them again. We didn't like selling stones with "dyed stones might not be colorfast in contact with water or extended sun exposure" on the package. That is what we want to sell. If you want to see beautiful color in tumbled stones - without the use of dye - check out the stones on this page.